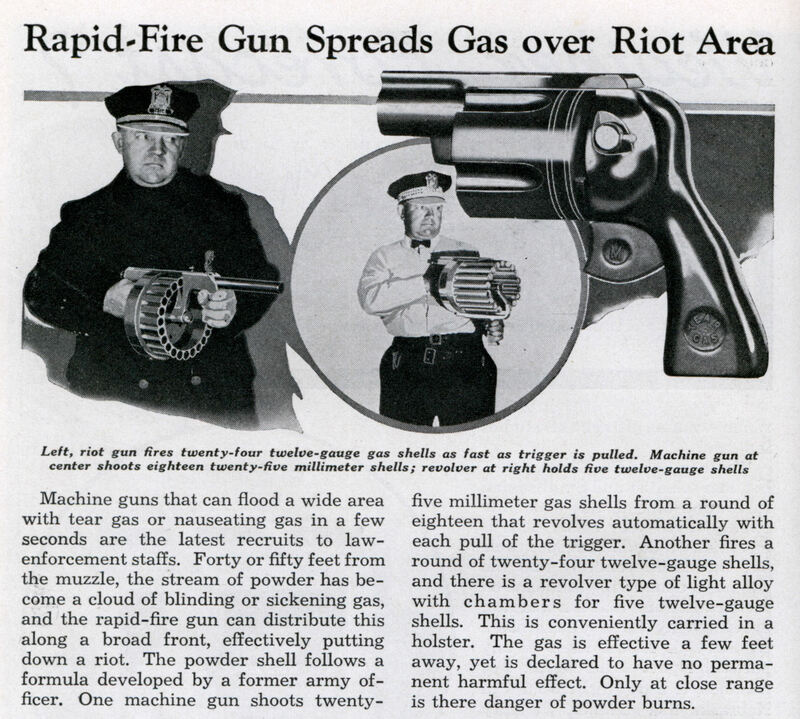 And improved 12 gauge tear gas rounds are still in use today while the rotary launchers are still sold now in 37mm. Machine guns that can flood a wide area with tear gas or nauseating gas in a few seconds are the latest recruits to law-enforcement staffs. Forty or fifty feet from the muzzle, the stream of powder has become a cloud of blinding or sickening gas, and the rapid-fire gun can distribute this along a broad front, effectively putting down a riot. 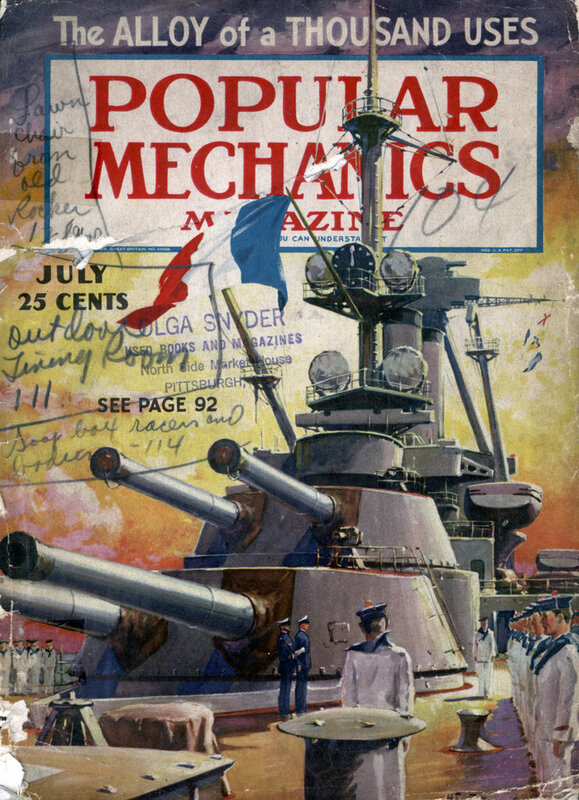 The powder shell follows a formula developed by a former army officer. One machine gun shoots twenty-five millimeter gas shells from a round of eighteen that revolves automatically with each pull of the trigger. Another fires a round of twenty-four twelve-gauge shells, and there is a revolver type of light alloy with chambers for five twelve-gauge shells. This is conveniently carried in a holster. The gas is effective a few feet away, yet is declared to have no permanent harmful effect. Only at close range is there danger of powder burns. I have a Taurus Judge 45/410 which is not bad, but I think a 12 gauge revolver would be a bit much. That revolver is real. it’s a Manville 12-gauge tear gas gun. The one in left is also Manville. Tear gas shells are much lighter than normal shotgun shells, so I’d say kickback is similar than in signal-flare guns. Sorry, almost all tear gas(es) are disbursed solids – often crystalline. What happens when you fire it at a crowd? The pie eating contest from “Stand By Me”? All made obsolete by the invention of the aerosol can. Abdul: How do you disperse a rowdy crowd from lets say 50 meters from you using your aerosol can? John, you are correct sir. That is indeed a Manville Projectile Launcher the type of weapon called an XM18 in the movie “Dogs of War”.